I am frequently asked if I earn from maintaining a blog. I do, but it’s very minimal. 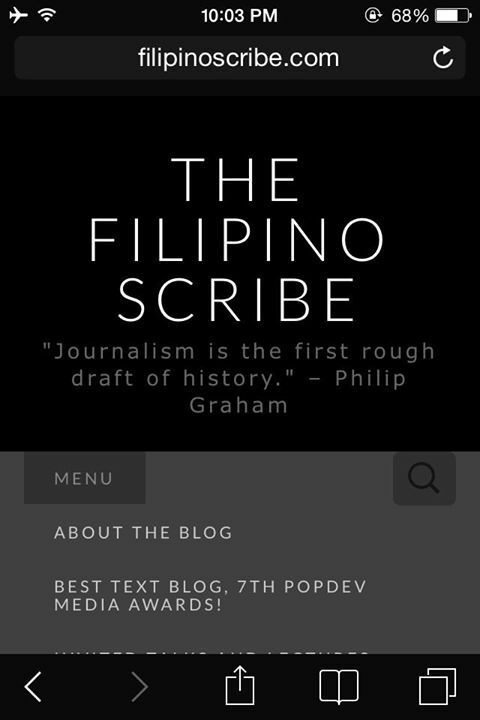 Before going into that, let me share with you a bit of The Filipino Scribe (TFS)’s history. I launched it March 31, 2011 as www.rightonthemark.wordpress.com. For two years, it stayed that way. In May of last year, I bought my own domain. TFS though is still hosted by WordPress.com, which is like me renting a house. If you’re only renting a house, there are many things you cannot do. The same logic governs web hosting. For example, I cannot really customize how TFS looks (don’t ask me though if I am knowledgeable about web development. LOL). WordAds is the only advertising system that WordPress allows, and it is only open for those with their own domains. In short, prior to May 2013, I did not earn anything from blogging. Is there really a potential to earn big from WordAds? On their website, they explain that advertisers pay more for page views from North American and European users. Based on my statistics, 90% of my readers are Philippine-based. 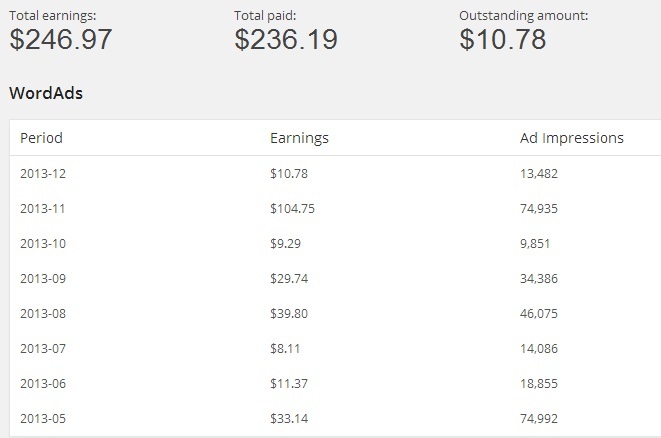 Earnings are updated monthly and users will only get a pay-out (made via PayPal) if they earn $100. As mentioned earlier, I’ve been running WordAds for eight months now and so far, there had been two pay-outs. It was made last November and December. The pay-out for November covers a five month period. It’s like earning a measly $20 per month! There was a pay-out for November because during that month, I had over 100,000 page views thanks to two blog entries about super typhoon Yolanda that became viral. 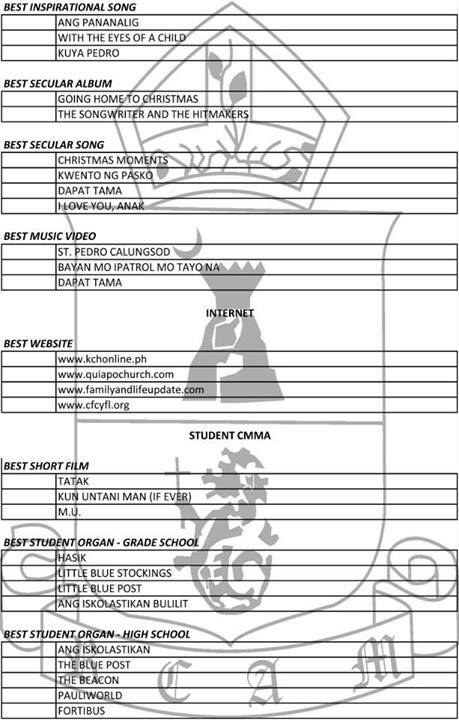 For three days, TFS was the number one in Top Blogs Philippines for all categories. I earned $100 for getting 100,000 page views? Sayang! With my blog’s third anniversary coming soon, I felt this is already the right time to finally make the move. It won’t be easy and cheap to be sure but moving forward is the only way TFS can grow. Plus, it is something I have to do to have more time for my other goals like finishing my master’s degree. Thanks to my friends from Ask Pinoy Bloggers and Filipino Bloggers Worldwide for their valuable insights. If I’m a college student writing a thesis, I’m still on the data gathering stage. I’m doing my best to get as much information as possible about my options. While pondering on these things, I can’t help but this saying: “A ship is always safe in the harbor, but that is not what it’s meant to do.” Instead, it should travel the turbulent seas and oceans ahead of it because that’s the essence of its existence. Indeed, we should never fear leaving behind our comfort zones to explore bigger things. The year 2014 promises to be a big one for this blog. Is it possible to acquire new knowledge for your personal and professional advancement on one hand while contributing to the relief efforts for the survivors of super typhoon ‘Yolanda’ (international name ‘Haiyan’) on the other hand? Most definitely! Session 2 – Ricky de Vera – YES! You Can Inspire As You Live! Interested attendees are asked to give a minimum donation of P1,000 per head. You can register online at http://trainings.ph/weareone. All proceeds will go to the relief efforts currently being undertaken in typhoon-hit communities. 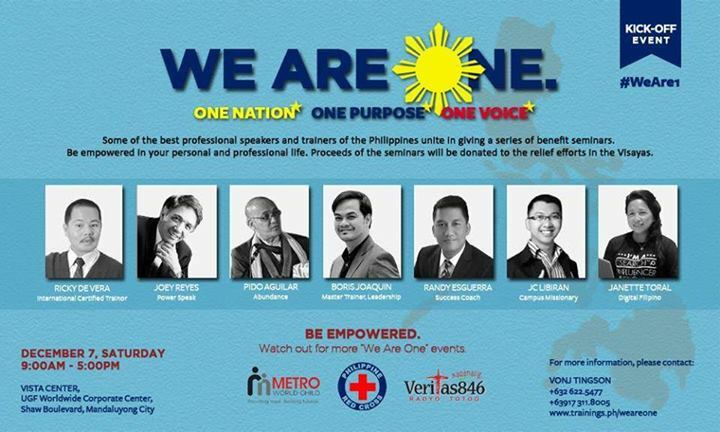 The one-day seminar will take place at Vista Center, UG/F Worldwide Corporate Center (along Shaw Blvd. across Star Mall) Pleae call Vonj Tingson via 0917 311 8005 or +622-5477 for more information. Personal: I will definitely not miss an event like this. Paying P1000 for a chance to hear the thoughts of such a powerhouse line-up of speakers is definitely a perfect deal in itself. What more considering the fact that the money will in fact be used for a noble purpose? Given my extensive engagement in social media the past five years or so, I am naturally interested in the session to be facilitated by Ms Janette Toral. Las May, Ms Toral had me as one of the speakers during the 9th iBlog (Philippine Blogging Summit). The panel discussion to be headlined by JC Libiran, Gwen Pang, and Pochollo Gonzales also intrigues me especially in light of recent events in the Philippines. It’s hard to imagine a year as bad as 2013 for the Philippines – a volatile political landscape, a burgeoning corruption scandal, as well as twin major disasters in a span of three weeks. 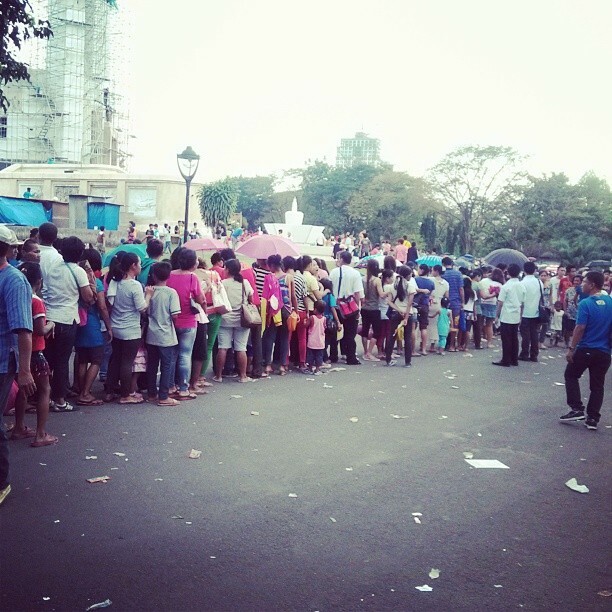 Given all these, it’s easy for any Filipino to feel powerless and hopeless about the direction of their country. Amidst the antipathy and the feeling of despair, we as Filipinos should be reminded that we can still take charge of our own destiny. PS: Please visit the event’s Facebook page for announcements.